Officially licensed by BBC Worldwide and features 100% original material, celebrating all eras of Doctor Who. In an exclusive interview, Karen Gillan reveals her thoughts on filming in America, Amy�s on-screen marriage, and what her hopes are for future episodes. The magazine also talks to one of Gillan's predecessors, Katy Manning, who played Jo Grant opposite Third Doctor Jon Pertwee in the Seventies. The opening episodes of the new season are set in the USA and although this is the first time major filming for the series has actually taken place in America, this isn�t the Doctor�s first visit by any means. Christopher Benjamin reminisces about working with Jon Pertwee in the 1970 story, Inferno, playing Colonel Curbishly in The Unicorn and Wasp in 2008, and creating the much loved character of Henry Gordon Jago in 1977�s The Talons of Weng-Chiang � a role he has recently returned to on audio. A look back at the moment that the Ninth Doctor confronted the Emperor Dalek in 2005�s dramatic season finale, The Parting of the Ways. All the Doctor�s greatest foes gathered to entrap him in The Pandorica Opens. The guide shows you who exactly was there for this momentous moment. The Time Scoop has collected the Silurians and the Sea Devils this issue. There is a closer look at the Earth�s original inhabitants and their encounters with the Doctor. 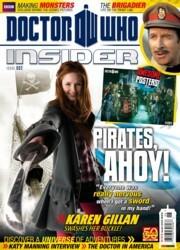 Previews of the latest Doctor Who merchandise, including Terror of the Autons and Planet of the Spiders on DVD featuring mini interviews with Richard Franklin who plays Mike Yates in both adventures; the Seventh Doctor gains a new companion in the audio adaptation of Lost Story, Crime of the Century from Big Finish Productions; and author Paul Finch tells how � and why � he gives the Doctor a rough time in his new novel Hunter�s Moon. A selection of photographs of fans and their incredible creations inspired by Doctor Who, including two lady Doctors and a tiki Dalek! PLUS! The latest official news on the second half of the new series, and a giant, doublesided poster of Amy Pond and the Pandorica alien alliance!